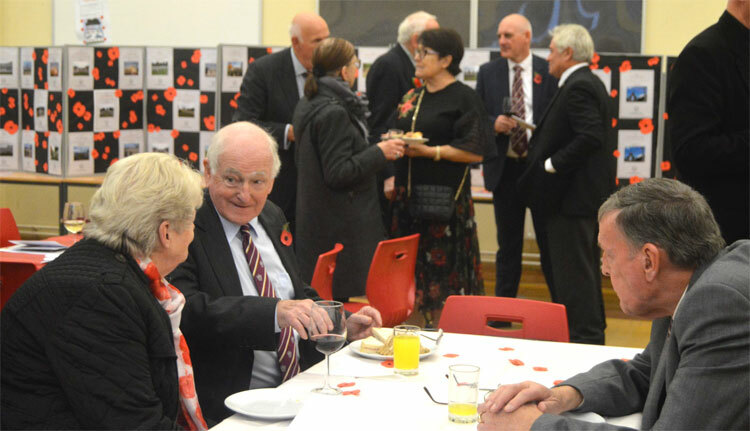 On Friday November 9th 2018, at Saint Cecilia’s School a very special and moving Service of Remembrance was held to commemorate the 100th anniversary of the ending of ‘The Great War’ 1918 – 2018. 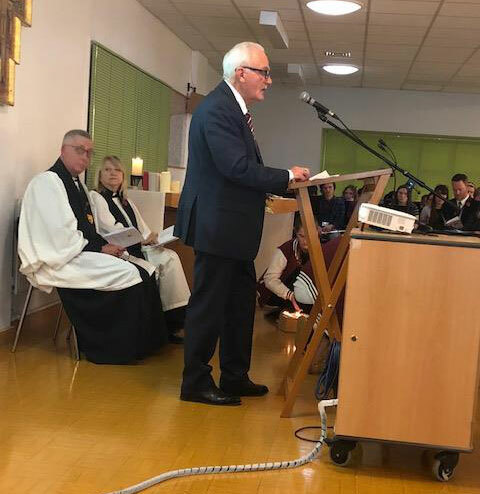 Below is our secretary Les Herbert opening the service to over 100 people, which included many former pupils of Wandsworth School and several teachers. 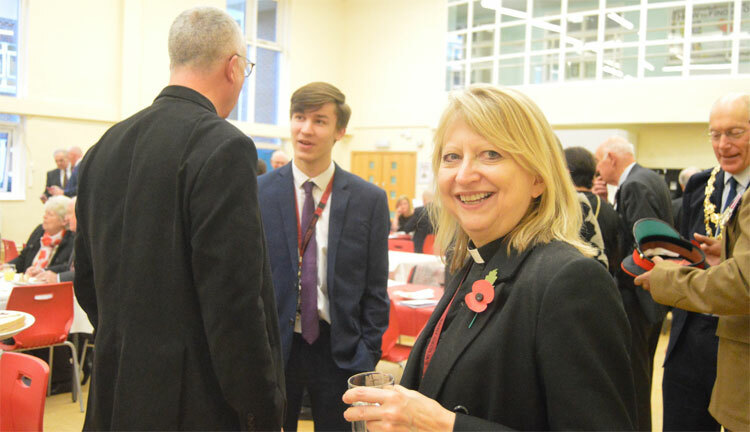 Honoured guest included the Mayor of Wandsworth Cllr Piers McCausland, Andrew Smetham (Former Head Master Wandsworth Boys School), Ann Kennedy (Head Teacher Saint Cecilia’s School) and The Venerable John Kiddle Archdeacon of Wandsworth. 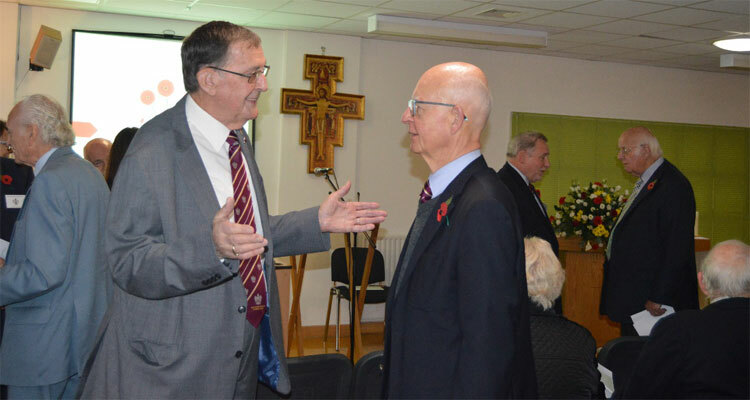 The service was led by the Venerable John Kiddle, and The Revd Annie Kurk (School Chaplain). 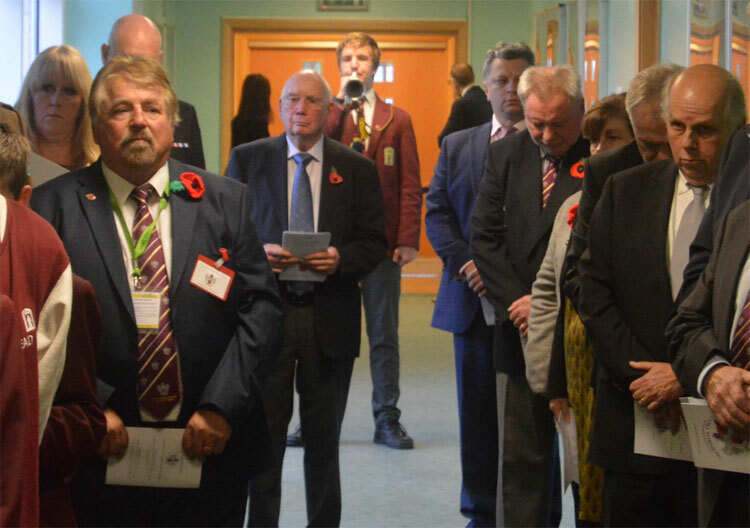 The school also paid a massive tribute to the 98 young former pupils and staff who fell in WW1 by lighting candles for each of these men who paid the ultimate sacrifice for their country. (The cross in the photo has the 98 candles lit to remember them all). 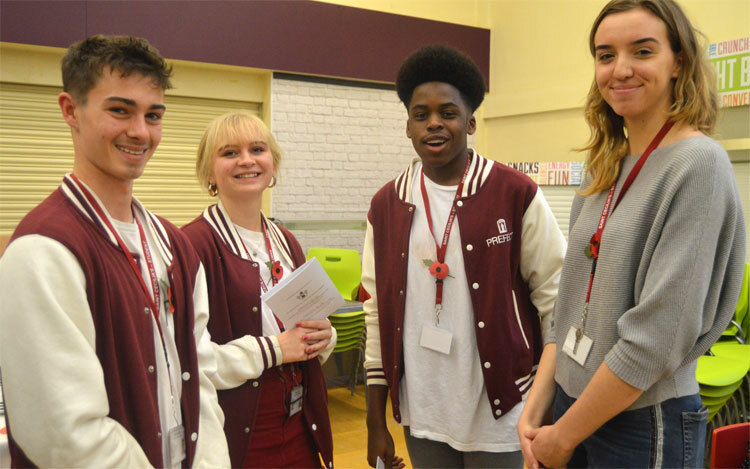 During the service we also had special tributes provided by former pupils of Wandsworth School. The first was a bible reading given by Ken Gerry seen here below (left of photo). Following Ken’s reading a tribute was performed by Adrian Thompson who sung two songs, accompanied by Glyn Harvey former pupil and head of music for Wandsworth School. We owe a special thank you to Glyn who also played the music throughout the service. This was followed by a tribute to the Roll of Honour for the 98 who fell in The Great War 1914 -1918. 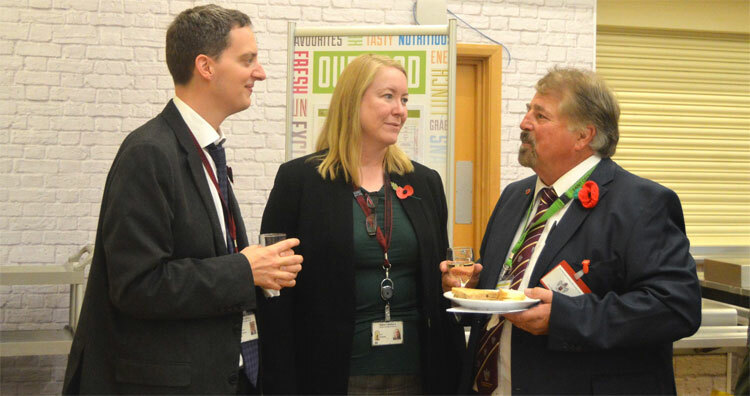 Here Les Herbert informed everyone how the Trust has tried to identify these names and develop the Roll of Honour page on the website. We have also been given some information and assistance from former pupil David Hyde who has provided us with greater details of the WW1 roll of honour list. We now know from the list of WW1 names, only 6 were over the age of 25, most were between the ages of 17 and 23. Their ranks ranged from Sappers/Privates to Sergeants/majors and some officers. All so young for huge responsibility. We also welcomed Graham Jansen, who is a member of the North Kent Family History Society. 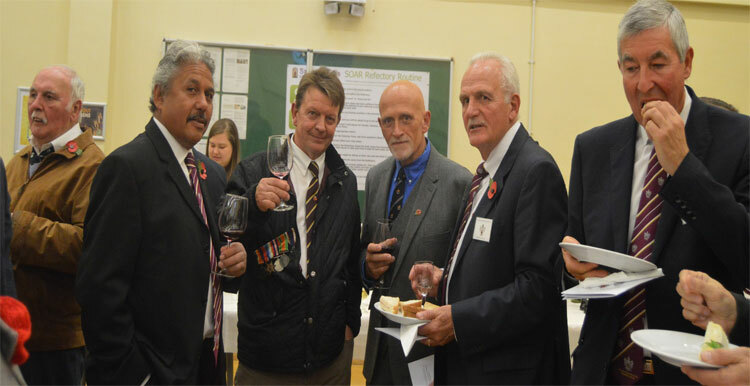 Graham contacted the Trust after he had come across a set of WW1 medals in an antiques market in Kent. These belonged to a former pupil of Wandsworth Technical Institute and is named on the memorial plaque. 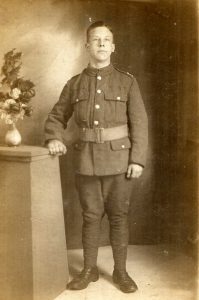 We now know that Albert Christian Havelock: Born – 1895, Lived in Southfields, attended Wandsworth Technical Institute and after completing his training in July 1912, at the age of 17, he started employment with the Post Office engineering section and then enlisted for the Royal Engineers in 1914. He was Killed in Action – 27th March 1916. 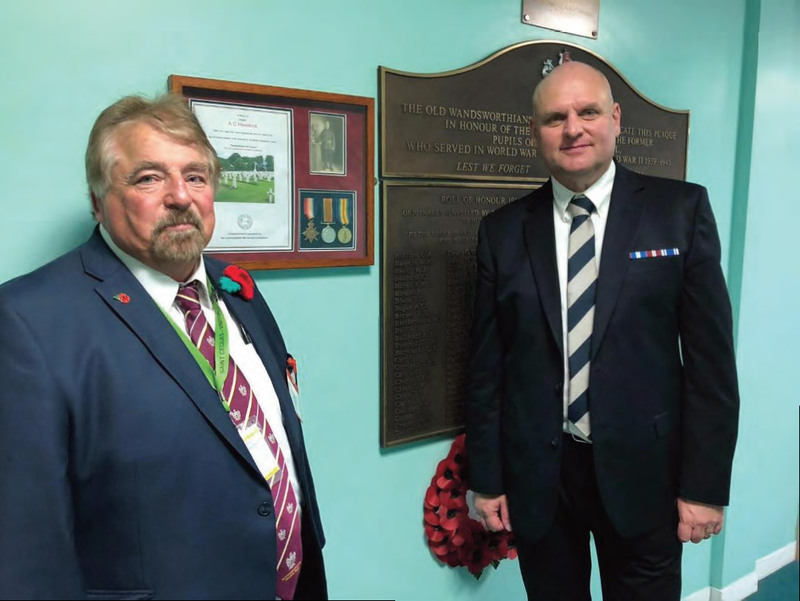 His trio of medals along with Albert’s photo and his War Graves commission Certificate have been framed and are now located next to the War Memorial to commemorate the 100 years since the ending of the war, where Albert and so many of his friends fell in combat. 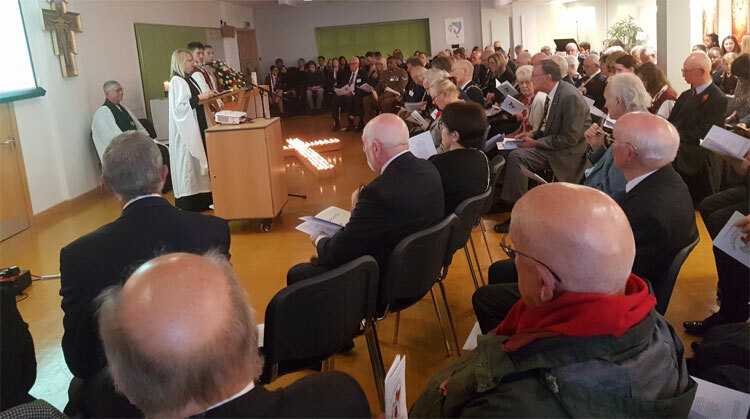 This was followed by silences/prayers and around the chapel several pupils of Saint Cecilia’s School read out the roll of honour list of all 98 who fell in WW1, at the same time lighting of the candles took place. 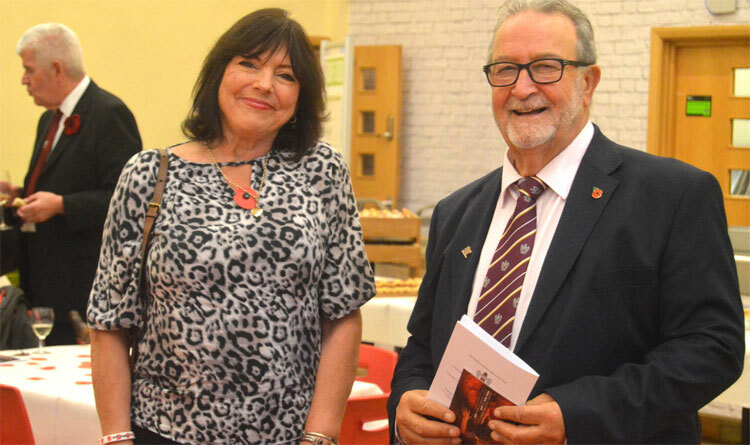 As seen in the next photo, Trustee Alan Bone paid a further tribute to the fallen of WW1, by reading a poem. In Flanders Fields, written by Major John McCrue in 1915, following the loss of his very close friend. The service in the chapel concluded with the singing of the National Anthem and prayers conducted by The Revd Annie Kurk (School Chaplain). 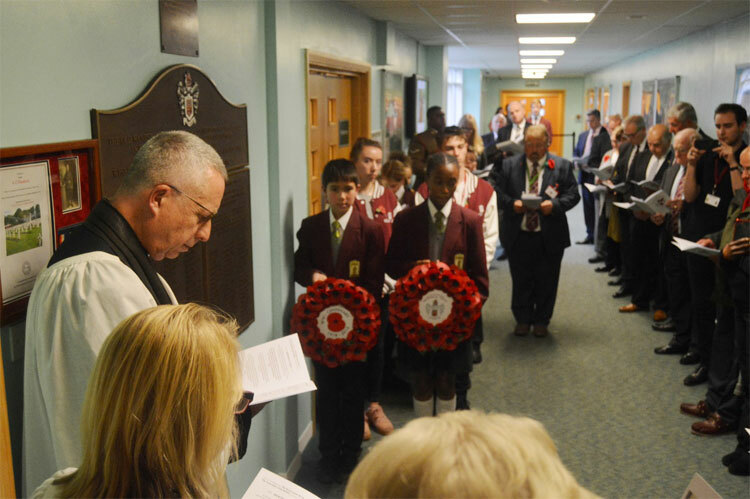 The procession lead by year 7 pupils Kellesha Elvy and James Gilmour carrying the two wreaths moved down to the War Memorial Plaque, where the Act of Commitment was held. Here the Archdeacon of Wandsworth lead the prayers and said, “Ever-living God, we remember those whom you have gathered from the storm of war into peace of your presence; may that same peace calm our fears, bring justice to all peoples and establish harmony among nations” Amen. Our honoured guest his Worshipful Mayor of Wandsworth then stepped forwarded and laid the WW1 wreath, followed by pupils Kellesha and James who laid the wreath on behalf of the Old Wandsworthians Memorial Trust. 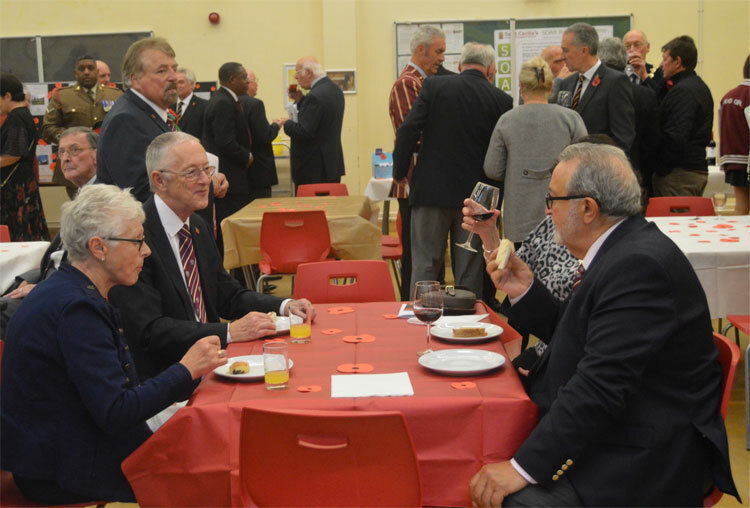 The service was followed by a social gathering in the school refectory, where we all saw world war one displays prepared by the pupils of Saint Cecilia’s School. 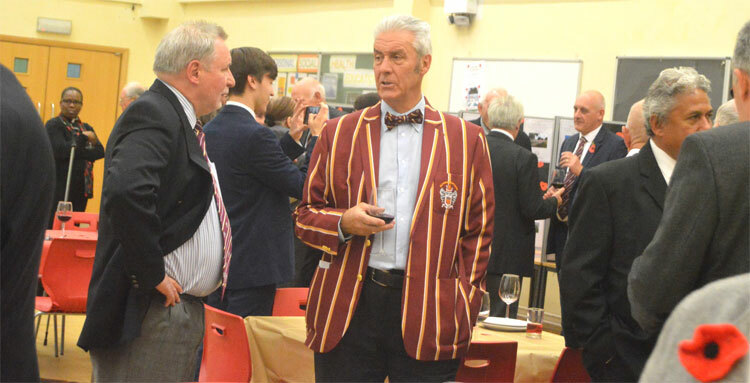 You will also see some photos of former Old Wandsworthians, Teachers and trustee’s speaking with many of the pupils of Saint Cecilia’s School. 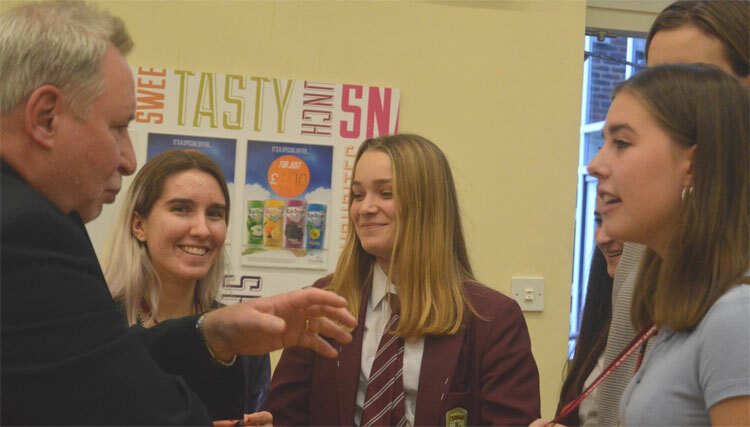 Chairman of the Trust Robert Andrews speaking with pupils of Saint Cecilia’s School.